I can’t seem to find any good articles or info that actually goes into detail on epoxy tables – I’m talking large amounts of epoxy within a table; epoxy casting. 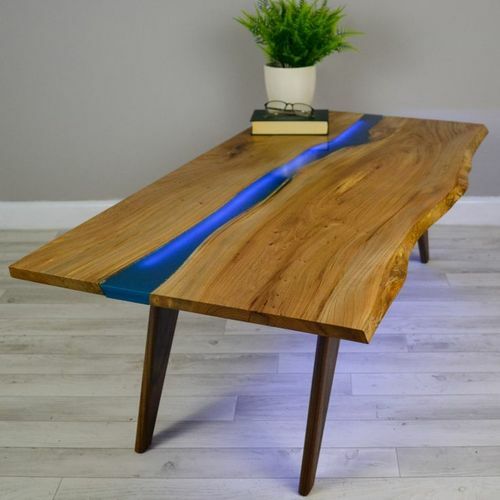 I want to build a table with some old broken pieces of cherry + resin, in the style of the Greg Klassen tables, but with epoxy. Most articles just describe filling holes & cracks with small amounts of epoxy. I know that I can build a mold out of melamine + 3mil plastic so I’m not worried about that – But I’m curious as to just how much resin/hardener that I will need, because I don’t have a sq ft. amount since it may vary. Is there any good articles that someone can point me towards to look into this? I would estimate the dimensions of the gap. LxWxH=Volume, then do a conversion to liquid. Add 10% for drips, miscalculations, other surprises. The pictured gap looks to be about 72” X 4” X 1.25” = 360 cubic inches. One cubic inch is equal to 0.5541126 ounces. 360 X 0.5541126 = 200 oz + 10% = 220 oz. There are 64 oz. in a gallon so you’ll need about 3.5 gallons of mixed resin to fill that gap. this was helpful for me http://eastcoastresin.com/p/instruction and http://www.raka.com/manual.html. I am still looking for a good article/video on how to use epoxy to finish a table top. most just show folks pouring the resin on then the project being done. the top I am working on has random low spots, I try to fill them but just create more low spots. feels like digging a hole at the beach. The pictured gap looks to be about 72” X 4” X 1.25” = 360 cubic inches. One cubic inch is equal to 0.5541126 ounces. 360 X 0.5541126 = 200 oz + 10% = 220 oz. There are 64 oz. in a gallon so you ll need about 3.5 gallons of mixed resin to fill that gap. Oops. Seemed a bit much when I did the original post. That’s cool. I really appreciate it. One other thing – I see people adding the epoxy little by little; like a plastic cups worth at a time, while blow torching out bubbles between pours. Is this the safest method to ensure a clear cast is made? & will epoxy adhere to epoxy? Epoxy is exothermic when curing. If you’re doing a large volume all at once, the heat generated by the curing can cause degradation of the epoxy, and depending on your wood, could damage that. Or possibly start a fire (though I’ve never heard of that). Mostly I think the worry is damaging the epoxy you just poured as it cures. Thin layers will give each layer a chance to cool before you pour the next one. Oddly enough, epoxy doesn’t seem to adhere that well to itself. It is usually recommended to sand between coats. But whether that would hold true in a large pour like that I can’t say. As Dave of Minneapolis says, large batches (even one cup) of mix can get very hot. And I have heard of it catching fire, though I’ve never seen it. Spreading a pour out lets it dissipate the heat. It’s common in wooden kayaks to pour epoxy into each end of the boat. The end of the boat is set into a bucket of water to keep the heat under control. Look at a product called ecopoxy, it can be poured up to 1 and 3/4 inch at a time.